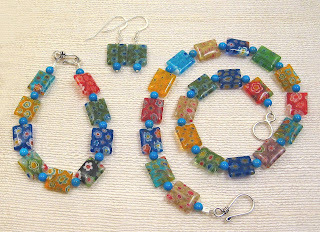 I just completed a fun spring/summer necklace set. This one I made for myself. The beads are Milleflore and Blue Howlite. I love the way each Milleflore bead is a little different, no two alike. It may look like it was made for a doll. I have a very thin wrist and neck. Once at a craft fair, a lady was looking at some of my chokers. She said, "you've got to make these to fit the rest of us; we don't all have a tiny neck like yours." I always appreciate feedback from customers, so that one really sunk in, which is why this set is not for sale. Linda- I get that comment alot too! I'd love to chat about how you gauge the right size for your "standard" necklaces.